The 3DS launch this morning was slightly confusing, because among the real games were several tech demos. One of those got a lot of people's hopes up. Rather than simply shrug the demos off as just that, though, Nintendo's Shigeru Miyamoto has instead said that they're actively combing through their back catalogue, searching for existing games that could benefit from being ported to the 3DS, whether it be by adding new features or by simply displaying the game in 3D. 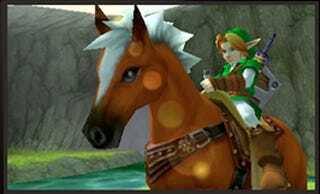 Using the Ocarina of Time demo as an example, Miyamoto said that he enjoys the openness of Hyrule field in the game, and wanted to recreate that sensation in 3D to see how people liked it. He also says that both the Ocarina demo and Star Fox 64 3D, another concept shown off today, aren't just concept pieces specifically designed for E3. Both are being "actively developed", and while this doesn't guarantee they'll ever be released to retail, it does mean Nintendo is looking seriously at what improvements could be made to the classics to make a re-release worthwhile. Zelda director Eiji Aonuma uses the example of Ocarina of Time's Water Temple. A notoriously difficult stage on the Nintendo 64, he says that a 3DS version could be made more enjoyable by making it easier, as touch-screen capabilities would make things like swapping boots and items a lot less of a hassle.